In the coming days, Wayne Rooney could become England’s record goalscorer. He needs just one goal to equal Bobby Charlton’s tally of 49 and two to claim the outright record. We today recall the previous time a player knew just a solitary goal would bring him level with Charlton – but it just wouldn’t happen for the previously prolific Gary Lineker. 1992 seemed to be a year where so many saw their dreams suddenly slip away with the end in sight: Labour in the General Election; England in the Cricket World Cup; Manchester United in the First Division title race; Portsmouth in the FA Cup semi-final; Jimmy White at the Crucible; Colin Jackson in the Olympics. And so on. But perhaps topping the bill was Gary Lineker, England’s captain and eternal goalscorer. From looking a certainty to become the first man to make it to 50 England goals, he cut a frustrated figure as the record slipped away from him. He would no doubt join Her Majesty in viewing 1992 as an annus horribilis. On November 13, 1991, Lineker scored a priceless late equaliser away to Poland to take England through to the Euro ’92 finals. It was his 46th England goal, leaving him just three strikes behind Charlton. Over the winter, Lineker made the surprising announcement that from the 1992-93 season he would be playing for Japanese club Grampus Eight and his international career would end after the European Championship. The hope was he would end with a flourish, inspiring England to Euro glory having become the nation’s record goalscorer. The former hope was possible rather than probable but the latter looked odds on. The first hint that Lineker’s final England year may not go entirely to plan came when they played their opening friendly of 1992 in February against France. Manager Graham Taylor made the rather surprising decision to drop captain Lineker to the bench, as Alan Shearer made his debut in attack. But Lineker came off the bench to seal a 2-0 win against a side who they were due to face in the Euro finals. Gary Lineker scores his 47th England goal against France in February 1992. Lineker was again on the bench the following month as England struggled to sparkle in a 2-2 draw with Czechoslovakia, this time not getting on the scoresheet after coming on. But in April he was back in the starting line-up away to the CIS (previously USSR) and headed in an excellent cross from Tony Daley to give England an early lead in another 2-2 draw. Towards end of the contest, Lineker saw a shot saved by Dmitri Kharine as he bore down on goal and then was unable to hook the rebound in. That meant he would have to wait to equal the record, but it was seemingly just a matter of time. Before England’s next game in Hungary on May 12, Lineker had signed off from English club football by scoring for Tottenham Hotspur in a defeat to Manchester United. The predatory instincts still seemed to remain, but then deserted him in Budapest. Set free by Paul Merson in the first half, he was presented with an opportunity just inside the box but fired wide. As with the miss against the CIS, it wasn’t like squandering an open goal but a forward of Lineker’s calibre was expected to make more of such chances. It was his one real opportunity all night in a forgettable game, but he did cross for Neil Webb to score the only goal in England’s 1-0 win. Lineker fluffs his penalty against Brazil during his final Wembley appearance. Five days after the match in Hungary there was a golden opportunity squandered in Lineker’s bid to break the record. Brazil’s visit was attractive enough, but for Lineker the match was particularly special as it would be his final appearance at Wembley. He had scored in his first game there against the Republic of Ireland in 1985 and it would seem fitting if he equalled – or even broke – the record in his farewell to the stadium. The omens seemed good, given Lineker had scored in each of his two previous games against Brazil. “You could argue that we played Brazil with 10 men,” said Graham Taylor rather controversially after Gary Lineker’s performance against Brazil. It was here the relationship between Taylor and Lineker began to unravel. A few days after the game, Taylor was quite damning when he told The Observer: “It’s almost as if Gary is a national institution who cannot be touched. You could argue that we played Brazil with 10 men – but you’re not allowed to.” Although there was some speculation that Lineker could lose his place for the finals, realistically he would keep it. He had not been in prolific form for England going into either the 1986 or 1990 World Cup, but he managed a total of 10 goals in those two tournaments (finishing tournament top scorer in 1986). Despite the Brazil setback, the record still seemed to remain a case of when and not if. “I want it out of the way as soon as possible,” said Taylor, as a good opportunity appeared on the horizon. England’s last match before the finals was away to Finland, against the side with the weakest track record they would face while Lineker was chasing the record. But again his luck was out, striking the bar from close range in a 2-1 win with Platt again the saviour. Fate seemed to be against Lineker and he would now go into the finals with potentially just three matches to get the record. Suddenly, it didn’t look so certain he would achieve it. Lineker’s cause was not being helped by a continual changing of strike partner or at times having no other recognised strikers up front with him, with Taylor continually experimenting and struggling to settle on his preferred line-up. Yugoslavia’s late expulsion meant England were starting in the finals against Denmark, a side not expected to achieve much after being called up to participate just days beforehand. 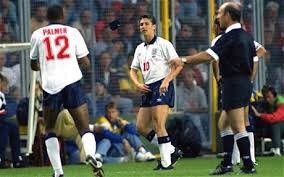 Again it was a frustrating night for Lineker and co, playing out a rather forgettable 0-0 draw in which England could easily have lost after their opponents struck the woodwork. As we recalled last week, Taylor now turned his attentions to Jimmy Hill over criticisms the BBC pundit aired afterwards. The mood in the camp was clearly not good with Taylor appearing increasingly tetchy towards the media. 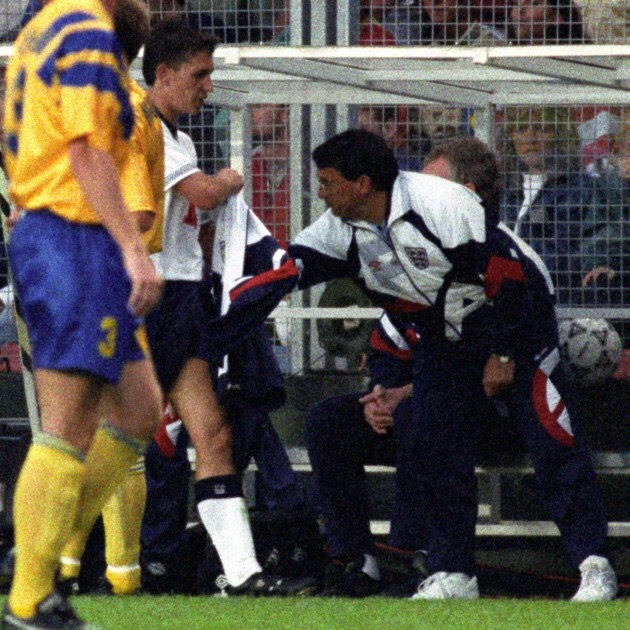 Lineker is hauled off against Sweden and it proves a sad end to his England career. To be sure of going through to the semi-finals, England had to beat hosts Sweden and at the very least they had to score and avoid defeat to stand a chance. Lineker was back to being the only recognised striker in the side but his former club manager Terry Venables, in his capacity as BBC pundit, said he was backing him to find the net. England started superbly, Lineker crossing for Platt to give them an early lead. They played well until half-time and led at the break, leaving them top of the group with 45 minutes left. But where they were excellent in the first half, they were wretched and outplayed in the second. From the moment Jan Eriksson headed in an equaliser they were up against it and as the hour mark passed Taylor knew he had to change things. You could hear the surprise in the voice of BBC commentator Barry Davies as he said Lineker was the player coming off, as Alan Smith took his place. “If England don’t make it to the semi-finals, what an unhappy end we are witnessing to Gary Lineker’s England career,” said Davies, sensing there may be no way back for Taylor’s men. Even co-commentator Trevor Brooking got vaguely opinionated, describing it as a “brave decision” and expressing his view that it would have been better to play two in attack (Lineker and Smith had forged a good pairing at Leicester City a few years earlier). The body blow duly came eight minutes from time, Tomas Brolin’s scoring an excellent goal to delight the hosts. With Denmark beating France 2-1, England knew an equaliser would see lots drawn to decide if they or the Danes progressed. But there was no realistic hope of them scoring again and ‘Swedes 2, Turnips 1’ would be the most memorable headline the following morning. Lineker’s dream was gone and Charlton, working in Sweden as a BBC pundit, unexpectedly retained his record. Perversely, Lineker scored 10 goals in two World Cup tournaments but none in either European Championship he played in (it later transpired he had hepatitis in 1988). England limped out of Euro ’92 after a very unsatisfactory tournament that saw the tide turn against Taylor. A combination of international retirements, injuries and certain players not fitting into Taylor’s plans meant of the side that faced Sweden, only Lineker, Platt, Stuart Pearce and Des Walker had played in the World Cup semi-final against West Germany just two years earlier. In several cases the old guard had been replaced by inferior players who would never feature again after Taylor’s reign. There was very little in the way of creativity in the side without players such as John Barnes, Chris Waddle and Paul Gascoigne. Where Italia ’90 had been an emotional rollercoaster that was never to be forgotten by the English public, Euro ’92 was a damp squib so far as England were concerned. Only at the point they exited the competition did it suddenly spring into life following several cagey matches, the Danes surprisingly going on to win the tournament. It is surprising that, for a few more days at least, no England player has so far reached 50 goals with several before Rooney having looked set to make it but then just failing to do so. Charlton may have the record but he would probably have loved to make it to the nice round figure of 50, failing to score during his international swansong of the 1970 World Cup. Like Lineker, he was infamously substituted in his final game and watched on as the side slipped out of the tournament. After scoring four against Norway in May 1966 to leave him on 43 goals, Jimmy Greaves would have seemed certain to go on and reach the half-century. But fortune would not be on his side and he finished with just one more. Michael Owen’s potency as a young striker left him on course for the record, but he was frozen out after Fabio Capello took over in 2008 and left with 40 goals. 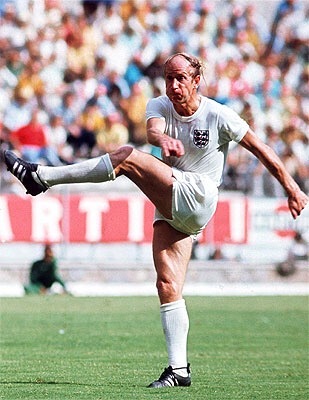 Bobby Charlton in the 1970 World Cup, where England goal number 50 was beyond him. And as we’ve seen, Lineker saw the target slip rough his fingers with that penalty miss against Brazil and substitution in Sweden forever recalled. It would be disappointment for Lineker, but there was plenty to put it into perspective for him. A few months earlier his baby son George had been diagnosed with leukaemia and undergone chemotherapy as the family feared for his life. Mercifully he pulled through. George’s illness had been a genuine worry for his father, not scoring goals for England by comparison was only football.